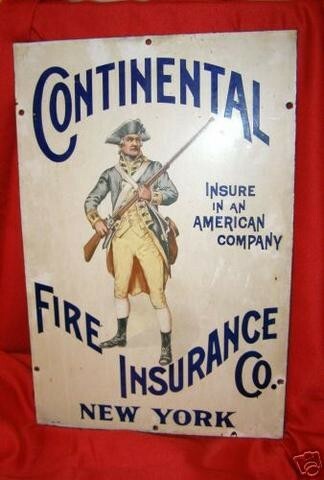 At 12″ by 18″, the Continental Fire Insurance Co. sign is well designed with a unique illustration. In most cases this sign is a single sided porcelain sign and it has several mounting holes on all sides. The center of the sign has an illustrated minuteman holding his gun pointing upward. The minuteman is a great illustration and a lot of time and effort was given to it. The text on the sign is blue and it reads “Continental Fire Insurance Co. New York. Insure in an American Company. The rest of the sign is a white background.